Five magicians are presenting a full theatre magic show at the Michael J Fox Theatre this month. “M” The Magic Show features a unique blend of cutting edge illusions, mystery, music, audience participation, comedy and sleight of hand. 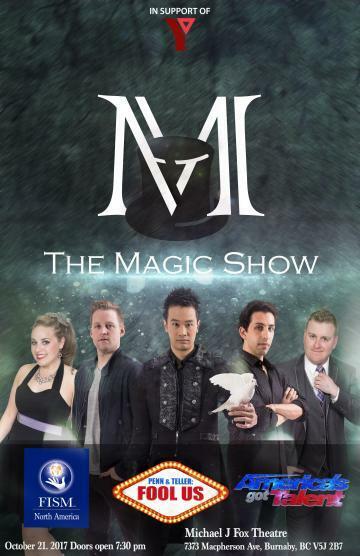 Featuring five illusionists (including two who have fooled Penn and Teller): Kelvin Ng, Wes Barker, Vitaly Beckman, Trevor and Lorena Watters. “This is not your average magic show for children,” Kelvin Ng says. Kel, whose act has appeared on Fairchild TV, Fairchild Radio and Channel M, offers a combination of comedy and skillful sleight of hand that has left audiences spellbound and has successfully sold out shows at the Michael J. Fox Theatre and Massey Theatre in the past. The proceeds of the show will contribute toward the YMCA’s annual campaign that focuses helping kids, youth, seniors, and adults to get access to community programs like swimming, high quality child care, education and after school programs that they wouldn’t be normally able to have access to on their own. Each ticket purchased will help fund families and help them grow in our community that will lead to healthier and happier lives. I will draw three winners at random from all entries at 12:00pm on Monday, October 16, 2017. Update The winners are Michelle, @Kreative22, and Becky! Can I trust the prize draw, or is it an illusion? Would love to take my wife to see this! I think it would be great to disappear for an evening for this show. Who doesn’t love a magic show. What could be more magical than winning tickets to this fantastic show?! What could be more magical than winning ticket to this fantastic show! Would love to take my son. Enter me into the draw please!! I’d LOVE to go to a magic show!! Would be good for the kids to see. Would be a fun night! I love a good magic show! Sounds like fun! Would be a great date night. I’d like to take my husband to see this. I would love to go with my teenage daughter who used to love magic tricks when she was little. I would love to take my husband to see the magic show. It would be a great date night! Sounds like a fabulous show! I would love to take my wife to see the magic show! This show would be amazing! The YMCA does great work and is a good cause to support. Looks like a great show! I would love to take my husband to see the show! Great prize, who doesn’t love a little magic in there life! What a funny magic show? Thanks for sharing.